This section starts at our river camp Salto de Chucao and continues to the Puente Futaleufu. It is the most action packed section of whitewater you will find anywhere. A virtual whitewater power storm. This section includes five miles of Class 4 action, in addition to three class 4 + rapids. Entrance rapid.
" Make a reservation for your flight on Air Futaleufu"
Fortunately there is a big pool beneath Pillow. The kayak and safety cataraft runs first to set up safety for when the raft comes through. "This team on this day goes for the throat in Mundaca"
There is a pool beneath Mundaca. But after that it is non-stop whitewater action coming at you. After Tiburon it calms down and we administer the swim test for those that have aspirations to continue on to the Class 5 action. (Class 5 Rafting, Kayaking) Hang on! We pass under the cement bridge in the swirlies and we hear the roar ahead. This is big stuff coming up. It could have been easily called the Perfect Storm. It is one of the most appropriatly named rapids on the river Mas o Manos. We wind around a couple of bends but keep your eyes peeled……a pounding htdraulic is waiting to surprise those not paying close attention.
" Getting lined up in Class 5, to make order out of chaos." 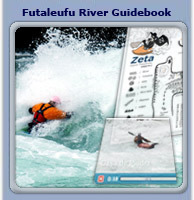 El Macal Section - Intro to the Futaleufu. From below "Casa de Piedra" to "El Macal", these Class 3/3+ rapids, with easily defined routes are the perfect introduction to the Futaleufu's big water. The cascading waterfalls off the massive cliffs will leave you breathless. Our favorite rapids are ‘Huenumapu’ and ‘Freighter Rock’. The take-out at El Macal becomes the put-in for fly fishing trips and our Sea Kayak trips.